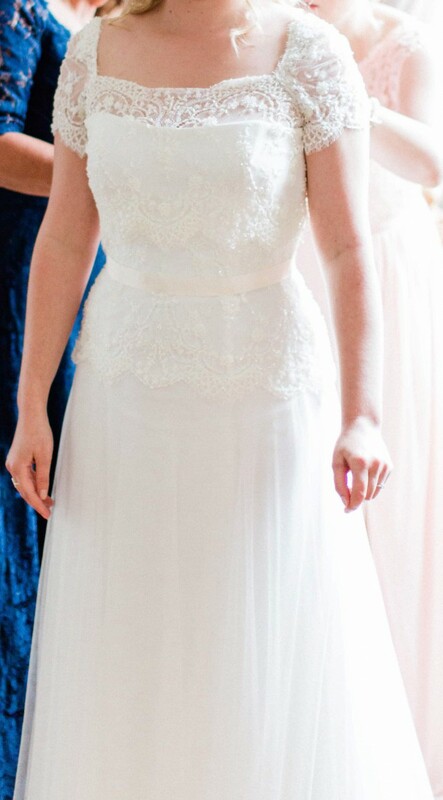 An absolutely gorgeous ivory Jesus Peiro A-line dress which I loved wearing on our wedding day in May 2018 in a French Château. It has the fairytale class and elegance for your perfect wedding day - it certainly played a part in making our wedding day like a dream. It's a two-piece with a strapless dress and a sleeved lace & bead top. The strapless dress has a lace decoration and a light champagne coloured ribbon which was sown on to accentuate the waist. It's sown in with thread in 4 places so it can be easily removed if you wish not to use it. The dress has a beautiful, soft train that flows with your movement and the underskirt was ordered with a lighter fabric to keep it airy and cool. The dress has a concealed zip in the back. The lace top with sleeves has soft, elegant bead decoration throughout and a row of white buttons in the back. Obviously, the dress can be worn with or without the top. I wore the top until our first dance and then took it off for the disco! The dress was taken in slightly to fit my UK size 12 body (the equivalent of US 8). The dress was also slightly shortened. I am 169 cm tall and wore 8 cm heels. The champagne coloured ribbon was sown into the waist but can be very easily removed if you don't want it. Once you send a message, Susanna can invite you to purchase the dress.